New Santa Ana | Was this Pulido’s last State of the City Speech? Was this Pulido’s last State of the City Speech? 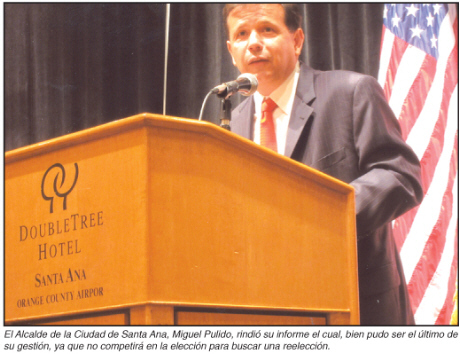 An article in the latest edition of Miniondas, a Spanish language newspaper in Santa Ana, covered Santa Ana Mayor Miguel Pulido’s recent State of the City Speech to the Santa Ana Chamber of Commerce. The article stated that this is Pulido’s last run for Mayor. It was a bit vague and could be interpreted to mean that he is not running this November, but I think that Pulido’s intention is for this to be his final term as Mayor. In his speech Pulido mentioned his support for the Dream Act, which offers a path to citizenship for students who are undocumented. Pulido also talked about a November ballot measure which will prevent the state from raiding city redevelopment funds. He also complained about the recent flawed O.C. Grand Jury report, which sought to cast aspersions on the Transit Zone development. A spurned ex-city commissioner was on that Grand Jury, tainting the results of their investigation. The article also stated that Pulido has some critics who are angry that he has been in power for over 20 years. His opponent, Al Amezcua, was noted, as were some of Amezcua’s supporters, including Dr. Art Lomeli and Sam Romero. Neither of them live in Santa Ana although both operate businesses in downtown Santa Ana. The article also noted that Pulido led the Santa Ana City Council in opposing Arizona’s racial profiling law, SB 1070. Pulido closed by saying that Santa Ana is headed in the right direction, with regard to education and our economy. Why is it that these clowns who don’t live in S.A. want to tell us who to elect as Mayor? Why vote out one questionable Mayor and put into office more of the same? Your handle above….what does it say??? I own property and have businesses in Santa Ana. I am a stakeholder. As a businessman and property owner it is relevant who governs the city I make a living in. Members of the policemen and Firemen associations almost exclussively do not live, own property or have businesses in Santa Ana.. Their political action committees spend unlimited sums of money on the Mayor Pulido’s campaigns. Over 95% of donations to Mayor Pulido’s campaigns come from sources outside Santa Ana. I guess you do not have a problem with this as you a political insider ignore this. WHY? You did not check with Miniondas before writing this blog? 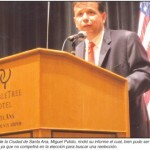 The article as I read it says Pulido is not seeking re- election this coming November. I did check with the newspaper owner a week ago. He said that part was an error. Why would I check with Miniondas? They wrote the story and they obviously need to issue a retraction, or at least a clarification. That said, I do believe this will be Pulido’s last run for Mayor. I could be wrong, but that is a sentiment shared by many city insiders. If that is the case, we should start thinking about who will replace him in 2012. My guess is that Vince Sarmiento will the top candidate. I think Claudia Alvarez will likely run for Assembly again. But if she wants the Mayor’s job, it is hers for the taking. My inside information is that he has no intentions of not seeking re election until he is challenged out. This illusion of one term is to keep council members supportive with the promise / illusion that they are next in line. I thought that you the administrator of a news source would be interested and obligated in presenting correct up to date information. So now you are resorting to attacking me? For a mistake made by Miniondas? Nice. It sounds like Team Amezcua is getting a bit desperate. And for the record this is a blog, not a newspaper site. That said, if you want to start coming after me, go ahead. But this tactic will backfire on Amezcua. Does he know you are doing this? I cannot imagine he would be happy to have us attacking him. Up until now we have remained neutral in this campaign. Of course you guys also pushed Michele Martinez into Pulido’s corner. What sort of campaign behaves like that? Addition by subraction doesn’t work. I am sorry if you believe I am attacking you in some way. I only asked you 1 question. Thank you for the clarification. In the past you have taken pride in scooping news. This was where I was coming from. I won’t expect anything more than a blog, sorry. Why your fixation on Amezcua. I am communicating with you not anyone else is. The Miniondas article does not mention where Sam and I live. Why do you mention it if not to seed attacks directed towards me. Yes you do not attack me , but produce the venue and subject matter to do this and in so doing indirectly bring in Pulido’s challenger. Is this staying neutral on your Part? All this from, did you check with the source of your blog piece? If I wanted to attack you I would have noted that you live in wealthy Orange Park Acres. I don’t see a reason to fact-check newspapers. We made it very clear in this post that we questioned what Miniondas was reporting. That said, you are clearly a spokesperson for Amezcua. And it would appear that your team is getting desperate. You mentioned it , so I guess you are on attack mode. I am sure you would like to live there too. You have made your position clear. I guess you have forgotten that Sean and I supported your campaign for the RSCCD Board of Education in 2008. We are not the enemy. But I guess we are also no longer friends. That was your choice, not ours. It seems we never were friends if this insignificant debate has made you angry. I have not said anything about breaking friendships. Just be careful on personal attacks against past friends.You have been there done that..
Like Sean, I bear no ill will for you. However it is quite obvious that you and the others on Team Amezcua are willing to do anything to get him elected, including insulting those who are your friends. We will continue to report on this race in neutral fashion. Don’t expect kid gloves. As for your last comment, you know full well that those “past friends” opted to go with the Usual Suspects. I gave them a choice and that was their choice. I will not waste my time on people who want to be friends with the Usual Suspects. Nor should you. You have not talked to him about any issues. Just your opinion as you stated you approach to your blog is. That is a lie. I did indeed try to talk to Amezua about the issues, recently. He said he did not want to be specific as Pulido would steal his ideas. Why don’t you tell Amezcua to put some actual ideas on his blog, instead of the pithy BS that is currently found there? Al has said he will post his solutions at the appropriate time not that he will never do so. Be accurate. Maybe understanding your blog piece by you contacting relative to this thread might of produced the right time. You did not give him the opportunity. That is my point. He had ample opportunity and he still does. Amezcua needs to get his plans up on his site and I will be happy to do another post. I truly doubt he will have anything new to say but let’s see if he can prove me wrong. Sad day in Santa Ana= The day people elect a person who has tried and failed at fixing problems that have existed for years!! !